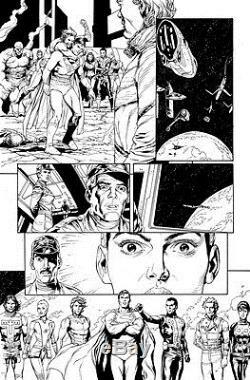 1 - page of Gary Frank and Jonathan Sibal original comic art from Action Comics issue #863, page 17. This is the original art page used to publish the comic and the only one in the world. Original comic art will contain smudging, marks and other imperfections. Only exception is for prior customers. A few have caused us to take these extra precautions. The item "Gary Frank & Jon Sibal Superman Legion of Superheroes Original Comic Art 863 p17" is in sale since Thursday, October 20, 2016. This item is in the category "Collectibles\Comics\Original Comic Art\Interior Pages". The seller is "sterlingclass" and is located in Naples, Florida. This item can be shipped worldwide.